Casey wakes up in Gabby’s trailer, too injured to eat. Gabrielle tells Jones that he can stay there and rest up if he wants to, and Casey says that he might. Jones then dials the local police to report the incident, but when the operator answers he just hangs up. He grabs a drink and heads outside to take a walk. April is reading about the Foot violence in the New York Times. The story sparks her memories of the Foot burning down her antique store. Robyn interrupts her sister’s thoughts and the two head out to do some shopping. Gabby gets an hour off so she heads home and is surprised to find Casey still there. Jones has cleaned up the trailer and made lunch that they share. Master Splinter is in the woods of Northampton, Massachusetts, attempting to meditate, but something is on his mind and he cannot concentrate. Casey and Gabby are talking about the family that Jones left behind in New York. “You miss your family, huh Casey?” Gabby asks. With that out in the open, Gabby kisses Casey. In New York City, an Asian businessman is riding on a bus. He opens his briefcase and connects a cordless phone to his laptop computer, using it to hack into the power company’s computers. He flags an account as seven months overdue. The power company discovers this odd glitch and wonders how it got past them for so long without anyone noticing, but rather than investigate further, they simply shut off the electricity in a building – one that the Foot Soldiers are using as a headquarters. In Tokyo, Japan we see a conference with numerous business people gathered around a table. A man notes that their software has almost completed beta test phase and that it is a pity that they allowed the New York factions to go to war for so long. A woman notes that it was to their advantage to wait. “In chaos there is weakness.” she states. Back in New York City, the Turtles prevent a woman from being mugged by three men. Raphael is tired of being a street vigilante and wants to find the Foot. We see the old man in the hospital, sitting up for the first time with assistance from his nurse. Leonardo tells Raphael that they just need to wait, and that in time their path will be revealed. With that, Raph sees a strange robot emerging from out of a van driven by Foot Soldiers. The robot starts destroying a nearby bus, the one that contains the businessman who had earlier hacked into the power company’s computers. 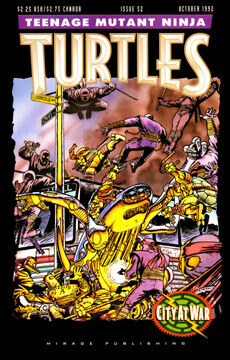 The Turtles attack the robot and an army of Foot Soldiers appear from nowhere. Chaos ensues. Raph manages to destroy the robot, and the guys regroup, only to find themselves surrounded by Foot Soldiers and two more robots. “What a revoltin’ development this is.” Raph notes as the Foot close in. In the final panel we see one of Shredder’s Elite poised on top of a building.